The United States government is concerned about new threats of Iranian-backed terrorism against diplomats and high-profile religious leaders in the Middle East from operations by Tehran’s Islamic Revolutionary Guards Corps (IRGC). "Iran continues to be a malign influence in the region and play a destabilizing role, especially in support of the Assad regime and Hezbollah," said a State Department official involved in Iranian affairs. "The department takes threats to its personnel seriously and takes necessary precautions to ensure their safety," the official said, without elaborating. The official made the comments when asked about new fears disclosed to the Free Beacon by a security source in the Middle East on Wednesday that the IRGC is planning a new round of terrorist kidnappings of foreign diplomats and others. According to the security source, IRGC operatives in West Beirut and Lebanon’s Bekaa Valley are preparing to conduct kidnapping attacks of foreign diplomats in the region, especially those from the United States and its allies. Other potential kidnap targets include Sunni and Christian leaders, the source said. The goal of the kidnappings would be to influence events in Lebanon and neighboring Syria. The source said the IRGC plans to conduct the kidnappings using the name of an obscure Islamist group. However, the real perpetrators are expected to be the IRGC and its regional proxy, Hezbollah. The kidnappings would signal a return to the tactic used by Iranian-backed terrorists in Lebanon from 1982 to 1992 when a total of 96 foreign hostages were taken from 21 different countries. Most of the victims were American and Western European nationals. At least eight of the hostages died in captivity, including several who were murdered. Among those killed during the hostage attacks were CIA Beirut station chief William Francis Buckley and Marine Col. William Higgins. The IRGC is the covert action force engaged in both terrorist operations and intelligence activities in support of Iran’s Islamist regime. A subsection, the Quds force, has been linked to terrorist and other attacks in the region. "The uncompromising support of [Iran’s] supreme leader for the IRGC has turned this organization into the most powerful entity in the Iranian government in several sectors, including the military and economy, as well as in the political arena (for instance, in the current administration, more than half of the ministers are IRGC officers)," states a recent Pentagon report published with the Library of Congress. The security source said the new round of kidnappings would signal a return to "the bad old days." The Iranians are continuing to back the embattled regime of Bashar al-Assad in Syria, which is facing opposition from a group called the Free Syrian Army that is known by U.S. intelligence agencies to be infiltrated with al Qaeda and other jihadists. 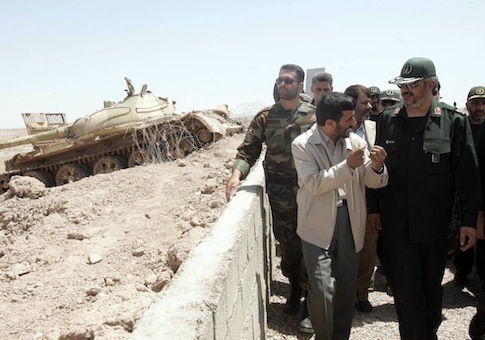 "The Iranians are determined to reinforce the [ruling Syrian] Alawites with both weapons and men along the coastal strip of Syria," the source said. "They are also investing heavily in Hezbollah in west Beirut." There are new fears that the civil war in Syria will destabilize Lebanon, which is at risk of splitting into warring fiefdoms, as is happening to Syria. "Lebanon could well descend into armed stalemate," the source said. According to U.S. officials, Islamist groups and their attacks in Syria grew sharply over the last several months of 2012. Some 110 attacks were carried out in September, 233 in October, and 247 in November, an official said. IRGC spokesman Gen. Ramezan Sharif told Iranian state media that IRGC Quds forces are operating in Lebanon and Syria with the goal of supporting both countries. But he denied the forces represent an Iranian military presence. "At present, the IRGC has military attachés in around 15 world countries, including Syria and Lebanon, while the Islamic Republic Army has sent military attachés to a number of other countries," Sharif said. The new terror threat comes as the United States supplied 200 armored personnel carriers to Lebanon on Thursday in Beirut, the AnsaMed news service reported. Gen. Martin Dempsey, chairman of the Joint Chiefs of Staff, told reporters at the Pentagon on Thursday that the U.S. military also has a "planning element" in Lebanon as part of efforts to bolster the country’s security against violence spilling over from Syria. This entry was posted in Politics and tagged Iran, Middle East. Bookmark the permalink.